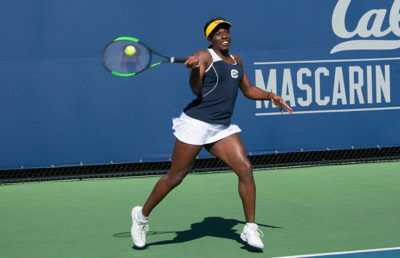 Midway through Cal women’s tennis’ action-packed 4-3 loss against No. 8 UCLA on Saturday afternoon — a day after a commanding 7-0 win over USC — a group of students stopped by the Hellman Tennis Complex. Captivated but uninformed about the singles battle between Cal freshman Julia Rosenqvist and UCLA sophomore Ena Shibahara on court one, a member of the group audibly posed the question. To answer the individual’s ponderings, Shibahara entered the match as the No. 8-ranked singles player in the country, while Rosenqvist has been one of the Pac-12’s most intrepid performers in recent weeks. Each arrived on her respective campus as one of the most promising recruits in their class. So yes, this was more than just a club-level showdown. Rosenqvist made few mistakes on the afternoon, but she persevered through a late injury scare in the second set to stun Shibahara, 6-3, 6-4. Midway through the second set, Rosenqvist grasped her right shoulder, resulting in a stoppage. With just one game to win, Rosenqvist came out of the break serving underhand and grimacing with nearly every shot — and still managed to pull off the improbable outcome. Just two weeks ago, Rosenqvist made headlines by taking down senior Terri Fleming, another ranked competitor for the Bruins. “I’m really proud of her, because our goal as well as with the team is to get as many individuals into (NCAA) singles and doubles at the end,” said head coach Amanda Augustus. Despite Rosenqvist’s stellar play, lost opportunities in doubles doomed Cal for a second consecutive time against UCLA. The Bears entered play Saturday just hours after recording an inspiring, perfectly executed dismantling of USC the afternoon before. While both matches were played in cool conditions, Friday’s sunny atmosphere radiated in conjunction with Cal’s wire-to-wire win. Meanwhile, Saturday’s midmatch rain delay put a literal damper in what was shaping to up to be an exciting finish. The No. 32-ranked Hauger rallied one of the Bears’ six singles wins Friday afternoon, soaring past USC junior Rianna Valdes, 4-6, 7-5, 6-3. Earlier in the day, Hauger paired with Rosenqvist to kickstart Cal’s magical day at the courts, defeating the No. 43-ranked doubles duo of Valdes and sophomore Angela Kulikov. 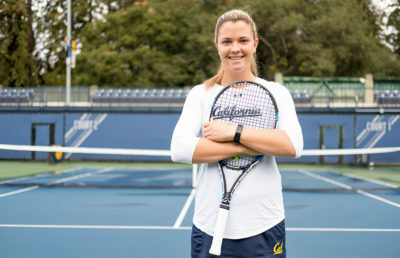 For the second time in two weeks, Cal junior Maria Smith scored a singles win over USC senior Madison Westby, with this round being the clinching point that snapped the Bears’ three-match losing streak. 24 hours later, they battled at an elite level, but once again, the Bears found the loss column. A large crowd on hand watched as the Bruins overcame Rosenqvist’s gritty performance, edging the Bears, 4-3, overall — a score that proved the second match could have gone either way. “I think we had a couple opportunities to clinch the doubles, and I think we just have to know that we lost 4-3, and if we hadn’t lost that doubles point, we would have won 4-3,” Augustus said. Powered by strong days from freshman Abi Altick and redshirt sophomore Jada Hart, UCLA snagged an early 2-0 lead in singles and held on when Hart overcame Cal freshman Anna Bright in an elite showdown on court two. With all due respect to club competition, this was no club match. The Bears’ emotions were at an all-time high, and their spirits remained especially animated when Rosenqvist toughed out her final set against Shibahara.